As you may recall, Steve and I both upgraded from the iPhone X to the iPhone XS. We justified such silliness by promising our daughter Lindsay and her husband Nolan that they could have our iPhones X. Lindsay’s iPhone 7 Plus was fine, but she really wanted Animoji. But Nolan’s phone was an iPhone 6 Plus and the poor thing was really struggling. Armed with this great excuse, we looked forward to the announcement of the iPhone XS. Even for an “S” year, this upgrade was a bit of a snoozer. I kept waiting for some extraordinary feature to make me feel less dumb for upgrading my phone. You can say A12 Bionic chip and quad-core this and new and improved GPU that, but the iPhone X was already so fast I doubted we’d be able to tell the difference. The only thing I heard that made my ears perk up was the new and improved camera in the iPhone XS. I didn’t have a lot of time where I had the iPhone X and XS in my hands at the same time, but I did manage to run around the neighborhood and grab some photos with the two side by side for comparison just for you. Let’s talk about a couple of specifics they announced about the new camera and its sensors before we walk through my observations. Apple announced what they’re calling Smart HDR. Smart HDR uses faster sensors and an enhanced Image Sensor Processor (the brains behind the sensors). Technology aside, Smart HDR is supposed to bring more highlight and shadow detail to your photos. They announced an adjustable depth of field with Portrait Mode photos, but you can already do that with the app Focos so that didn’t blow my dress up. The bokeh is also supposed to be improved (that’s the fuzzy background in portrait photos) and there is supposed to be more low-light detail in the XS. They accomplish this with deeper, larger pixels. The larger the pixels, the more light they can let into the sensor. More light means less noise. I’ll walk through my findings of the differences in the cameras under different conditions. I’ve included comparison photos for the show notes. Note that other than resizing to make the comparisons I have not processed the photos in any way, they’re as they came out of the cameras. I took one photo of grass with a wood fence, and bright sunlight coming through the trees above. This is probably the best example of the high dynamic range, or HDR capability of the phones. The difference between the X and the XS is pretty dramatic in this test. The X has deep dark shadows, leaving the grass and some of the trees with little definition. 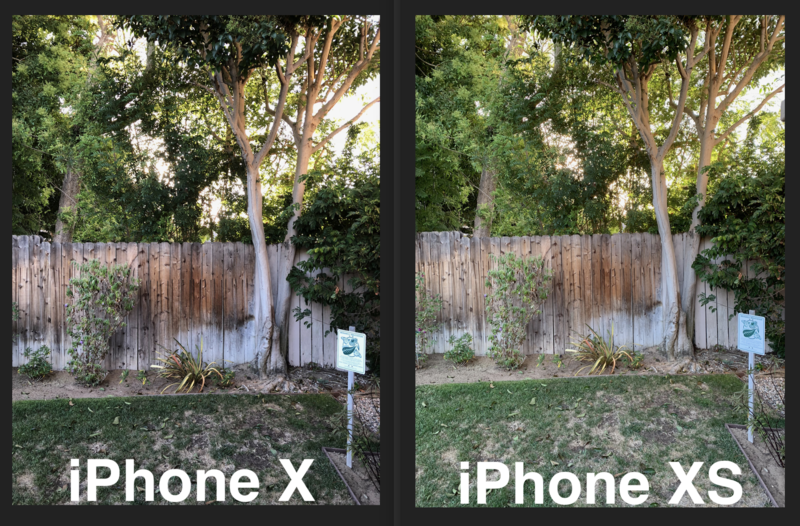 The XS does a much better job of capturing the highlights and shadows in the trees, the fence, and the grass. It’s a brighter picture overall but still shows depth of color. One of the hardest things to capture well with any camera is a bright red rose. I’ve tried with big girl cameras over the years and with different Apple and Android phones (and even a Windows phone) and there are always areas that have the red tones blown out. The best way for me to illustrate this to you is to bring the photos into Affinity Photo and turn on the feature that highlights in yellow any clipped tones. Clipped Tones are those areas that have turned all the same color because the sensor was unable to capture the different shades. 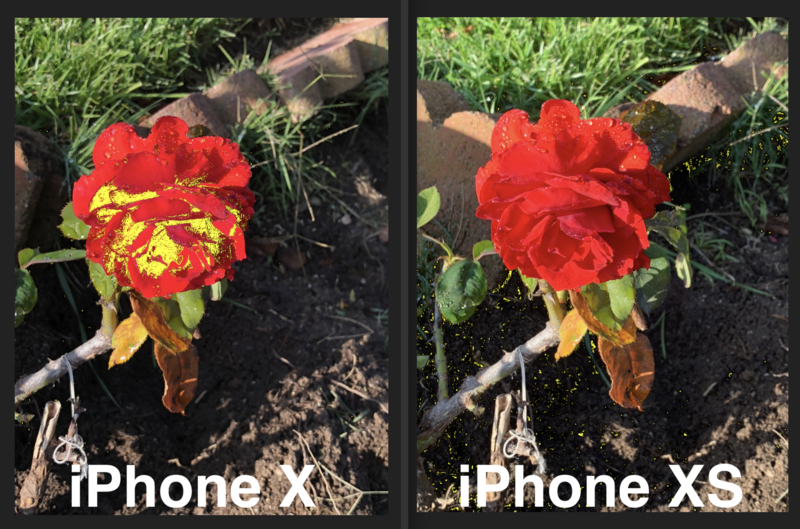 With Clipped Tones turned on, I compared two photos of the same red rose in my neighbor’s yard taken by the X and the XS. 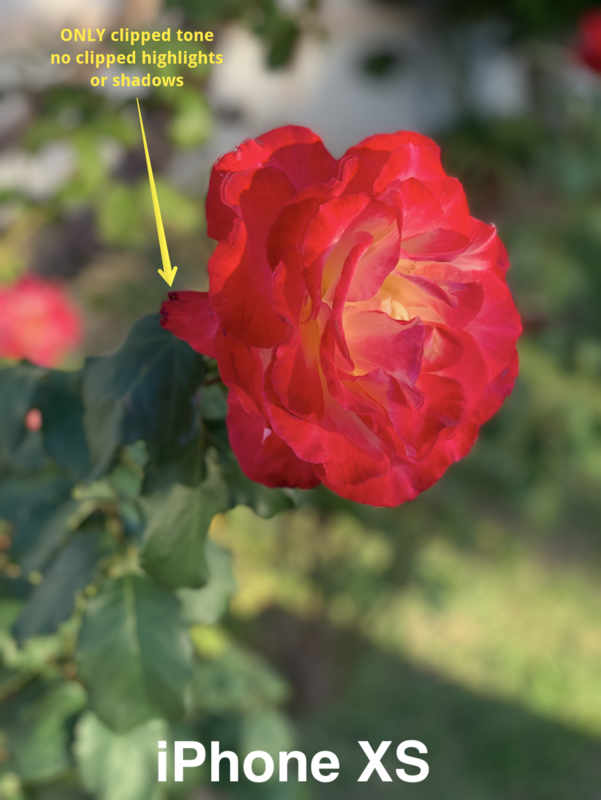 The iPhone X has a significant area of the red rose highlighted in yellow, showing that it doesn’t have the dynamic range to adequately capture the red tones in those areas. The iPhone XS has barely any of the tones clipped in the rose, but interestingly a fair amount of the dark ground is showing clipped tones. I guess the rose is the star of the show but clearly, the two cameras chose differently in how to combine the image from their respective sensors. Later after I’d given the iPhone X to Lindsay, I took another photo of a red and yellow rose in great evening sun with just the iPhone XS. I thought it looked pretty great, so I opened it in Affinity Photo and turned on the effect to show me the clipping of highlights, shadows, and tones. At first I thought the feature wasn’t working properly because there was one teeny tiny yellow dot signifying a clipped tone and zero areas clipping in highlights and shadows. Have to say, the iPhone XS for red flower shots pretty much rocks. I took a Portrait Mode photo of Steve sitting outside in the evening light. Both photos look great. Perhaps it’s because they’re of the man I love, but let’s set that aside for a moment. If you were to look at the image from the X by itself, I think you’d be unlikely to complain about it. But when you look closely at it compared to the new phone, the XS image is much more pleasing. Again like the picture of the trees and fence and grass, there’s a much smoother range of tones to his skin. His eyes in the X are deeply shadowed but in the XS the area around his eyes is much lighter. He has more range of skin tone across his forehead and his hair has many different shades. On the X photo, his hair on the side is very dark and without definition. I have to say I don’t notice any big differences in the bokeh they were so excited about. The good news is that the NASA logo on his shirt looks great in both images. My next test was to go for a super low light shot. As subjects for this test, I chose the two party hats Steve and I wore for the 13th anniversary show. Mine is a tiara (of course) and his is a top hat. I put them inside a closet on the floor, and almost completely closed the door, letting a bare sliver of light through. I held both phones at the same time side by side and took a photo. There’s no doubt at all that the iPhone XS captured a far better image. The glittery areas of the crown are very crisp and well exposed. On the iPhone X, the glittery areas almost look like the camera shook, but I don’t think that’s what’s happened. I’d entertain some argument on this point, but the two hats both have the number 13 written on them, and in the iPhone X shot the 13s are both crisp. If it had been camera shake, they would have been blurry too. I dove into the EXIF data to see what would account for the difference. Both phones took the photos at an aperture of f/1.8 so pretty wide open. They both exposed the sensor for 1/4 of a second. 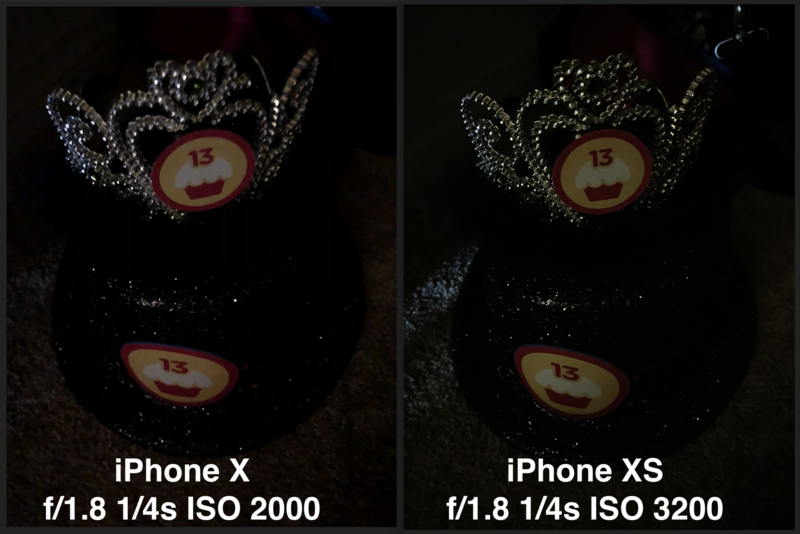 But the X used an ISO of 2000 while the XS used an ISO of 3200. That means the XS had a lot more light to work with (the equivalent of the shutter being open 60% longer). 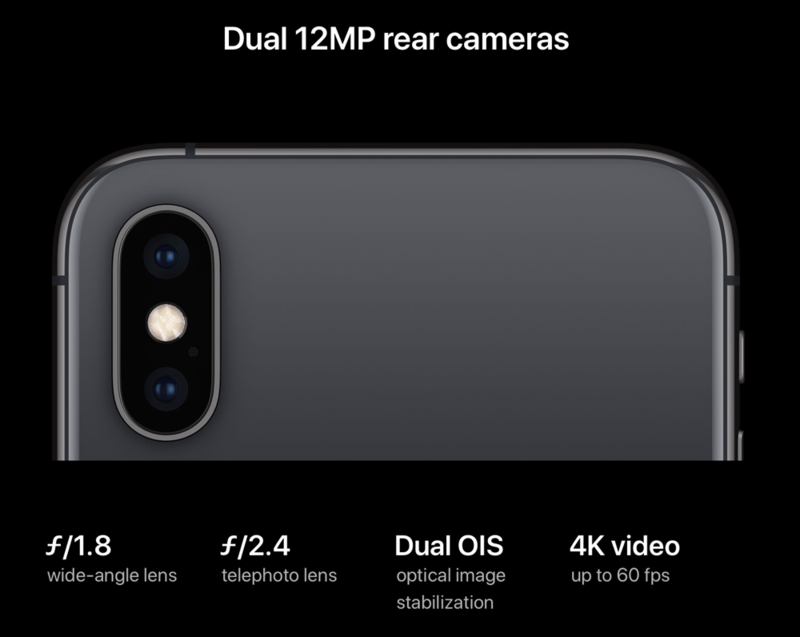 Using ISO to increase the light sensitivity of the sensor normally introduces a lot of noise, but Apple made a big deal about how they’re taking so many exposures so quickly that they can combine images to do noise reduction to make a beautiful photo. Neither of these photos taken in a closet is beautiful. In fact, the iPhone X did a better job at color reproduction on the carpet, but the XS is much clearer and more pleasing. Both scream, “get out of the closet, dummy! My final test was comparing two tiny bottles of barbecue rub using portrait mode – 0bviously a classic test that all fine photographers use. Instead of showing you the full photo as I did with the others, I’ve zoomed up very close. I wanted to show several things. The iPhone XS capture much more texture in the granules in the bottles and did a better job with color representation in the letters BBQ printed in red on the bottles. The difference in bokeh is much more evident here than in the portrait photo of Steve. The new phone has a creamier bokeh but they both have a fair amount of noise. 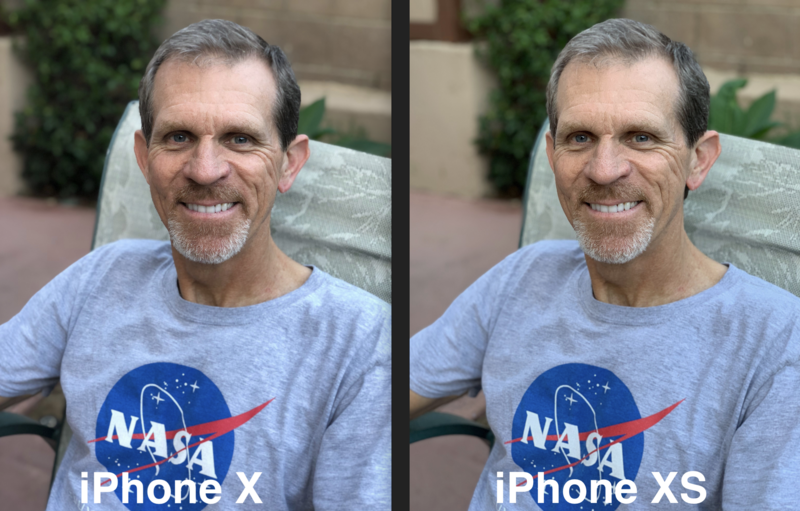 The bokeh area on the iPhone X image is blown out in quite a few places. I’d definitely give the iPhone XS the vote on a more pleasing photo than the X. The bottom line is that the iPhone XS camera is glorious and amazing and fun. The iPhone X camera is glorious and amazing and fun. If you have an iPhone X and you’re looking to drop $1000 for a new toy and are looking for an excuse, please use these comparison photos to make your case to yourself. If you have a beloved child looking longingly at your iPhone X and you really want to make them happy, use these images to help you as you tell yourself you’re just doing it “for the children”. If, however, you are a sane, rational person, put that $1000 in your 401K or give it to charity or put it in your beloved child’s college fund, or even save it till next year’s phone comes out and be happy with your iPhone X. Great tests, Allison. Would like to see this done with an iPhone 8, 7 and even a 6. (My wife has iPhone 6 while I have iPhone 6 Plus).